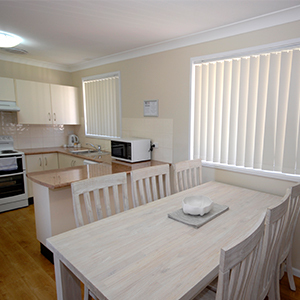 At Barrack Point Holidays, we value your comfort and the quality of your stay. Feel at home in our accommodations and have an enjoyable time exploring the club facilities. Our warm and friendly staff will be glad to assist you. We are located one and a half hours south of Sydney, and it takes 20 minutes from Barrack Point to get to Wollongong. guests can drop by the club and enjoy activities and entertainment for the whole family. Visit the Warilla Bowls and Recreation Club website. *Price includes GST. The rates are for 1-4 people/cabin. Additional prices are applicable for extra people. The special offers are available during Low Season only when checking in on a Sunday and checking out on a Friday. Stay for two (2) nights for $260 and receive a $50 food and beverage package. Stay for three (3) nights for $390 and receive a $75 food and beverage package. Food & beverage package can be redeemed at Cowries Cafe, Red Sands Bar & Grill or throughout any of our bars. Valid on cabins only and one (1) package per booking per week. Advance bookings only, minimum 48 hours. *Price includes GST. The rates are for 1-4 people/cabin. Additional prices are applicable for extra people. The special offers are available for guests paying for 6 nights at full price and receiving the 7th night free. A non-refundable $100 deposit is required per cabin, unit or house upon booking. Payments can be made via cheque, money order, Mastercard or Visa. The balance of payment for accommodation is required on arrival. Holiday houses have a minimum period of a two-night stay. Cabins MAY BE SERVICED DAILY for a surcharge of $15 per day, per cabin. This must be organised prior to arrival. For more information, contact on 02 4295 9554 or via email. 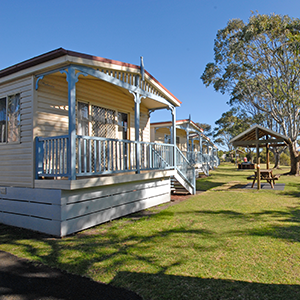 Barrack Point Holidays is situated on Little Lake. Our office is located within Warilla Bowls and Recreation Club, with the accommodation located within the surrounding areas. Great experience… good amenities, well located, fair pricing and brilliant staff. Staff were so eager to help and provide support, top class attitude. 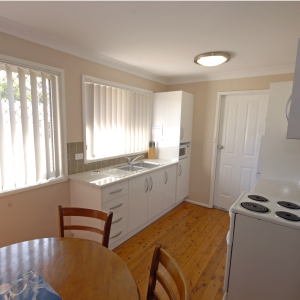 Located conveniently to Jamberoo Recreation Park. When on business on the south coast I stay here. The cabins are behind the club. Secure, quiet, well maintained, inexpensive and all I need and more. The beach is a short drive away. The club has a bistro which is walking distance away. Definitely, recommend this. Spent two nights in the cabins at the Warilla bowling club. Our cabin had been freshly painted and the bathroom looked very new. It had all the facilities for a short stay including linen and towels. The cabin had a large fridge and air conditioned. Very conveniently located next to bowling club and sporties club for dinner. Only downside was the sofa bed was very uncomfortable and unstable and not ideal for 2 adults. A bit of a tight squeeze for 6 people but fine for 1-2 nights.